Sometimes the mystery is enough. Over the span of more than 35 years as a journalist, mostly writing about the tourism industry, I’ve experienced some truly remarkable hotels and resorts. Those forever lodged in my memory have a consistent thread. They’re not the usual, cookie-cutter mass-market properties of bed, bathroom and balcony, marble vanities, 1000-thread counts, pillow menus and duck down duvets. The truly special have a blatant disregard for the ordinary. They’re flights of fancy, balancing whimsy and imagination with an occasional nod towards function. The wow factor (to use that hollow phrase so beloved of marketers) is, to me, something that tilts expectations off the axis and spins them far out into the Twilight Zone. They’re usually the pet projects of truly inspired individuals, people who can only function in what the rest of us call the real world by taking their own dreams and ideals and fashioning them in bricks and mortar, stone and glass. Some work, many don’t, for the simple reason that, all too often, that which the mind can envisage can never be satisfactorily realised in the real world. The visionary mind is an abstract; trying to fit it together like Lego compromises its very essence. Luckily, that doesn’t stop people from trying; we mere mortals can do little more than pick our jaws up from the floor upon experiencing the truly transcending. As I did at the Michi Retreat in Ubud, Bali. I’m not sure I’d ever want to stay there but I’m sure I’ll go back, time after time, just to marvel at the audaciousness of the place, wonder at what could have been and hope it never goes away. The Balinese town of Ubud is said to have magical properties, a place of healing and spiritualism, and it has long attracted those seeking a different path than the rest of humanity. It’s no surprise, then, that in a place where alternative therapies, past lives regression, crystal healing, kinesiology, transformational breathing, reiki, aura cleansing, chakra realignment and dozens of different kinds of yoga are considered normal avenues for the attainment of enlightenment, that there are places to stay that complements such beliefs. 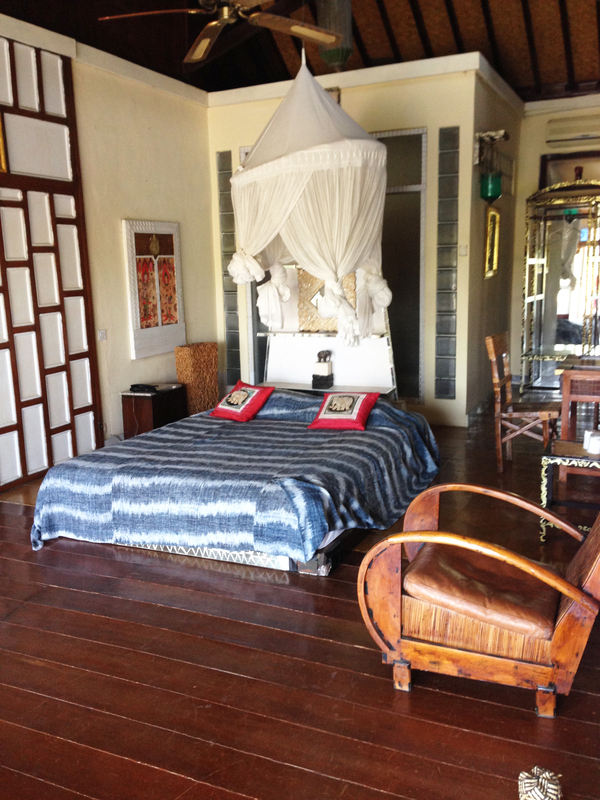 Ubud accommodation veers across the spectrum. There’s the Four Seasons Resort Bali At Sayan, which is a monstrosity or a stroke of genius, depending on your point of view. The Four Seasons spills down a deeply rainforested ravine with the Ayung River at the base, anchored by an ultra-modern tower that looks either like a spaceship or an airport terminal, again depending on your mood, inclination and generosity of spirit. Further along that same ravine and river is the Royal Pita Maha, encompassing a selection of private pool villas. 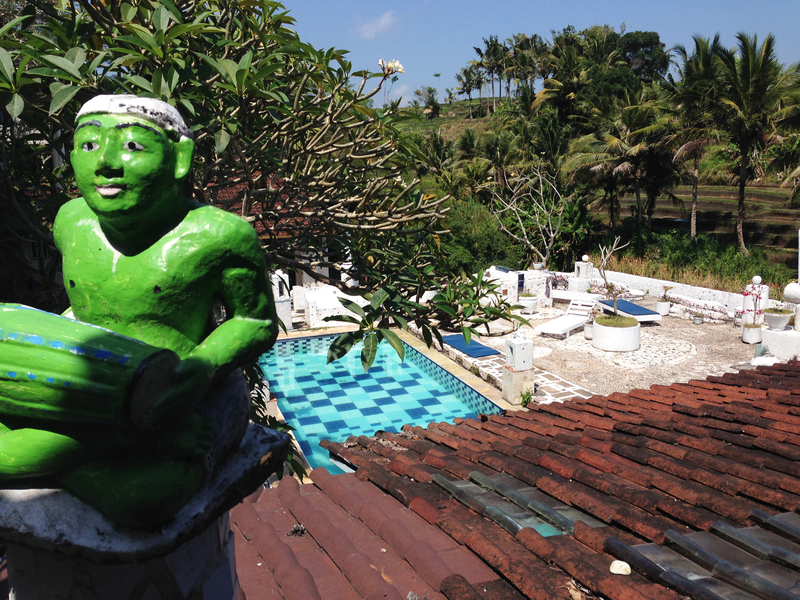 Owned by the royal family of Ubud, it is much more a traditional villa resort except for the long entrance driveway with some startlingly explicit statues of animals – elephants, pigs, frogs – with generously proportioned human genitalia. Traditional guesthouses, modern resorts, private villas surrounded by Ubud’s impossibly green rice paddies, there’s something for every budget and level of consciousness. And then there’s the Michi Retreat. The official website tells the story of a retired Japanese-American professor of history and sociology who built his dream some fifteen years ago. On the edge of yet another steep ravine, this time tumbling into the Wos River, the sacred river of Ubud, at the village of Jukut Paku, and opposite a rural vista of palm trees and rice terraces, he drew on a lifetime of influences to craft a rambling hotel complex where no one part is the same as any other and surprises await at every turn. 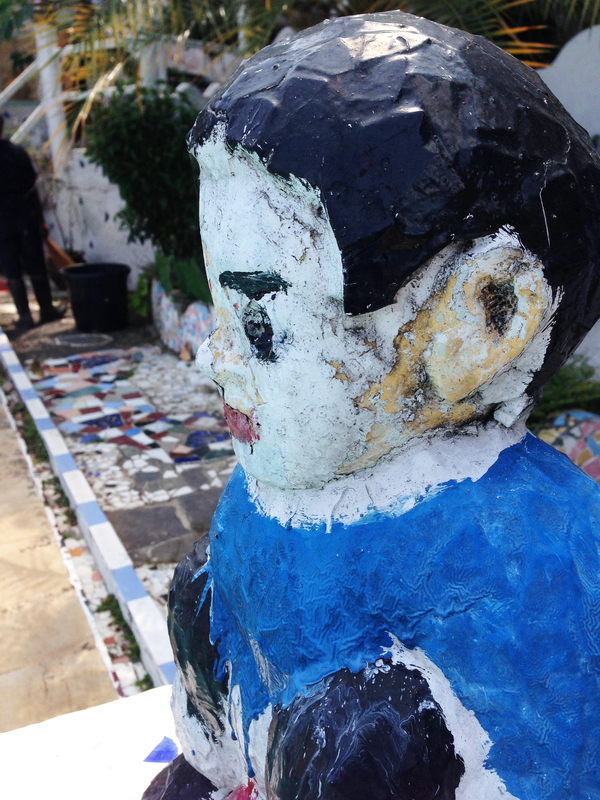 Standing in the midst of Michi, as we did on a hot cloudless spring day, was a very different experience. There was an eerie, deserted atmosphere. The doors were open to the rooms and we wandered from one to the other, checking out the studios that evoke an ancient hillside Berber village as envisioned by Hundertwasser and the upstairs suites including one with subcontinental Indian and elephant motifs. And the bathrooms! In every room, it was hard to tear our attention away from the bathrooms, each wildly different and supremely exotic confections. 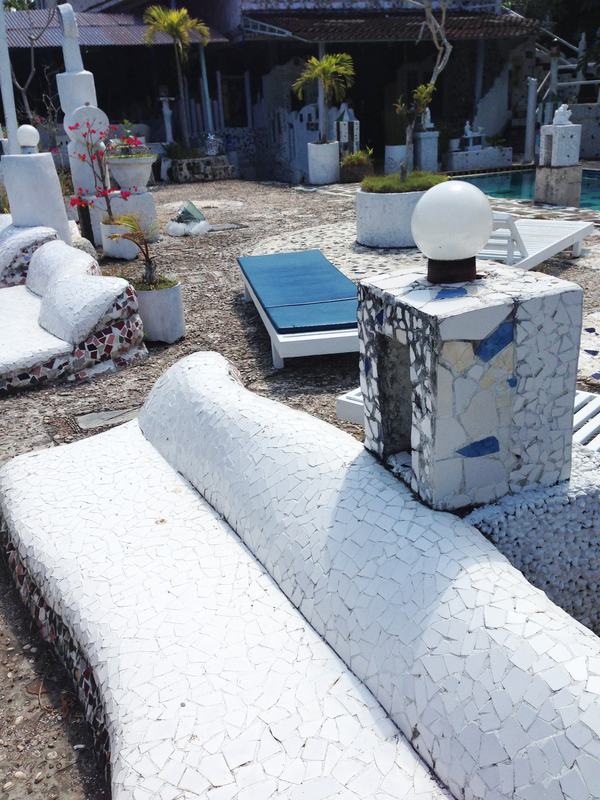 Mosaics, stone, pebbles, mismatched ceramics, mirror fragments of all sizes; on the pool terrace, undulating concrete benches studded with jig-sawed tile pieces evoked the Parc Guell. The adjoining restaurant area postulated a fantastic pop-cultural meeting of the minds, its shabby post-apocalyptic opulence like a Eurotrash 70s disco designed by Gaudi. Aside from the restaurant, there were few signs of life. There were areas, dusty with neglect, that must have been, not that long ago, shops, a beauty parlour, a spa. The jacuzzi is dry, the swimming pool not quite sparkling. There’s no reception at Reception except for leaflets announcing houses and apartments for rent within the complex on a daily and monthly basis. Amongst the facilities are listed “Kafe – Restorant”. Where is everybody? A clue may be on the website with the bizarrely honest admission that Michi’s “management is journeying through a paradigm shift” although there doesn’t seem to have been an update since 2011. Michi is a hotel you’d expect to find on the edge of the American desert, perhaps envisioned by Sam Shepard and directed jointly by Antonioni, Jodorowsky and Ralph Bakshi with Tarantino relegated to second unit, run by a guy who looks disturbingly like Harry Dean Stanton. It’s a familiar theme. You don’t want to stay there, it doesn’t feel right but your car has broken down, there’s a suitcase full of cash in the trunk and the cute little blonde at your side, the one with the elongated vowels and even more elongated limbs whose humid gaze can melt metal, is the mistress of a Texas cattle rancher with no sense of humour whatsoever. You know the movie. You’ve seen it dozens of times under a variety of titles. And Michi seems like the perfect setting, even with the rice terraces and palm trees and the slim sleek tabby with high-stepping elegance who guides us around like a new best friend. As the fantasy fades, so the realisation dawns that, quite possibly, despite the air of neglect, Michi may be as magical as Ubud is meant to be. I’ll come back to Michi. I’ll eat in the Kafe, swim in the pool, maybe even stay a night or two. Hopefully, I’ll meet the Professor. In a 2009 magazine article republished on the website, it mentions he’s 79 years old, which would now put him in his mid-80s. He’s had an amazing life, wandered the world, made fantastic friends, appreciated the arts and turned his dreams into a potent reality. I’d really like to hear his story. 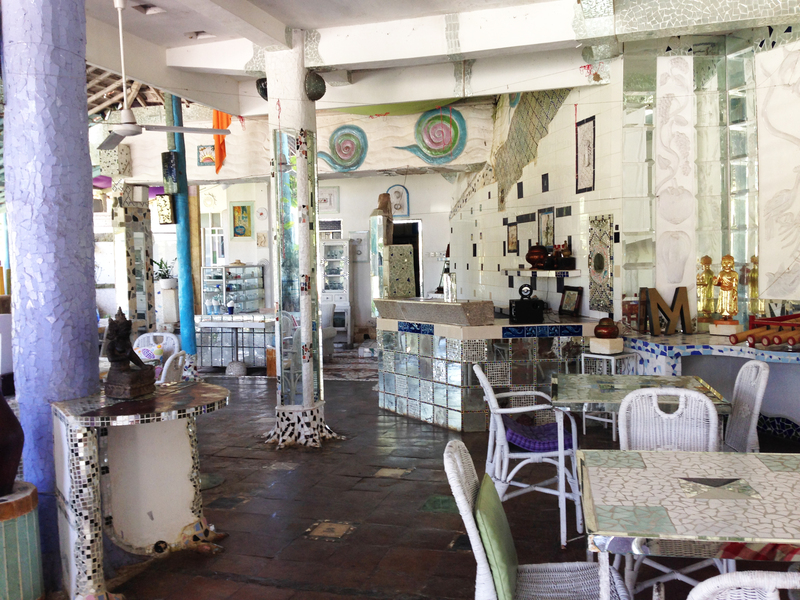 There aren’t many opportunities to understand the genesis of a place as special as the Michi. If the Universe allows, I’ll get that chance. If not, then the mystery will have to do. I just hope the Michi endures. The mystery will forever remain just that. In early March 2017, the founder of Michi, David S. Kung, otherwise known as The Professor, passed away. He was 86 years old. He was in Japan, where he’d travelled as part of a continuing book project that, as of this time, no further details are known. He will be cremated in a traditional Balinese ceremony quite near his beloved Michi on Friday 10 March.